Happy Saturday and welcome to Day 3 of the 25 Days of Christmas Crafting Fun with Cooking with Cricut and Paper Crafting World. We are super excited as we bring you a new theme today. Today's theme is Christmas Elf, Santa's Helpers, and Santa Workshop. For your viewing pleasure, I am sharing a card created with today's freebie! 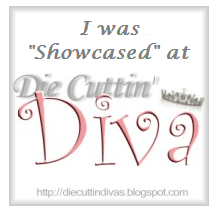 I'm entering this card in the challenge over at Die Cuttin' Divas. your card is sooo cute. Your card has it all, Christel, buttons, bows and bling! Just gorgeous, as always. CA-YUTE!! Yayy I grabbed my freebie for today now Im debating if I'm gone put the card up I was telling u about or if I'm gonna try again lol! OMG! THis has to be the cutest card ever. I love it. Thanks for joining us at DCD. Your card is definitely a cutie - I love it! Like the Elf card. Especially like the flag banners strips used. oh girl, I love those ribbon tails coming from under the image! Awe, so cute he is, thanks for sharing. This is so cute! Awesome job with the coloring, I have not made that leap yet but maybe one day, for now I just print in color! TFS.